The completely new adventure in sonic dementia from producer Eric Persing is here! DR2 is an audible feast of colors created with the very latest in sonic sculpturing technology. After three years of intense development, you can be sure that fresh inspiration is in abundance. Spinning metallic textures, singing oceans, vast amounts of unique loops (50-480 BPM! ), crushing impacts, glorious pads, crystalline galaxies, subsonic low-end and the many joys of feedback only begin to describe the wonderful noises in this collection. If you've never used DR, you have no idea what you're missing. If you are a fan of volume 1, your sonic arsenal is simply incomplete without "Darkness & Light". The classic demo showcasing some of the Distorted Reality vol.2 sounds and grooves that are included in the core library of Omnisphere and in Stylus RMX Xpanded. Just a small example of the amazing processed guitar ambiences from the Bizarre Guitar sample library that are included in enhanced form in the Omnisphere core library. You can find these grooves in Stylus RMX Xpanded and DR2. "Distorted Reality Vol. 2 is a work of genius. It's taken me ages to review, firstly as there is an awful lot of material to get through, and secondly so many of the sounds just invite you to play with them. Even though a sound can be so abstract it still sounds musical...The first volume was very good indeed, Volume 2 is even better. The amount of effort that has gone into the collection must have been tremendous, almost every sound has subtle movement, complexity, depth and evolution to it. The end result is a stunningly brilliant collection of sounds. Certainly if your going to buy only one volume I'd suggest Volume 2, but save up for Volume 1 as well as they are an ideal compliment to each other. All of the sections of the collection are very strong, I particularly liked the pad like sections, ambience, pads, drones & sweeps, the groove loops are brilliant and the loops in general I thought very good, perhaps a little more usable that the first volume....a truly excellent collection...for almost anything that you'd like a synthetic sound in then I would but this No.1 on your shopping list. A masterpiece in sample production...as a sign of how much I like this collection, and I've got more than most people !, is that this is now my favourite sample CD of all time. A very clever, well constructed and usable collection of unusual sounds. Makes you happy you own a sampler." "...possibly the most anticipated sequel in soundware history...this second twisted journey into the realm of darkness and light from veteran producer Eric Persing takes bold new strides into territories that the original Distorted Reality only hinted at...a tour de force collection of soundscapes....These samples move around the listener, snaking in and out from left to right, and behind and in front of the speakers....If you have even a slight interest in non-acoustic sounds for remix chores and film work, then you've come to the right place....How does the new kid compare to the original? For me, these two discs are a marriage made in heaven and, er, hell. Heaven thanks to the lush pads, beds, and ambient textures that abound throughout; hell because of the killer twisted grooves, drones, and sweeper patches. Almost every patch on DR2 stimulated my creative process. A big addition to DR2 is the inclusion of mod wheel effects such as filter sweeps, panning, and crossfading...endless, ethereal loops in a style similar to Brian Eno's mid-'70s experiments. All of the Drone and Sweeper volumes are chock-full of instant mini sci-fi movie score ideas...It wasn't a question of which samples I should use, but which ones I shouldn't use; there's so much excellent material to choose from...the dry, distortion rhythm loops, like 'Fuzz Pocket.' Trent Reznor would be proud...thumbs-up to the sweeping sound effects in the Reverse category. Great for transitions between verses and choruses...love those gnarly sci-fi pads and effects in the Fuzz section. There's just too much great stuff here to single out...I came up with dozens of inspired rhythm tracks within the first few minutes of playing with it...Spectrasonics is revered for their high standards in the sampling CD world. The Distorted Reality series brings us closer to the exotic and weird domains than ever before...The original Distorted Reality is still considered one of the top sources for bizarre, evocative loops and effects. Spectrasonics had a lot to live up to with DR2, and they didn't disappoint." 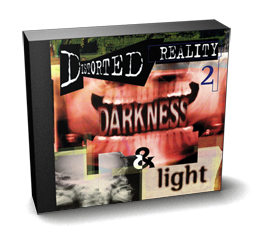 "Distorted Reality II must be one of the most anticipated sample CD ROM sequels of all time, but I can tell you now it really was worth waiting for. Distorted Reality II makes use of sound mangling toys that weren't even available when Volume 1 was made, many of which are software based...the rich textural pads, drones and backgrounds are the real stars...weird pads and drones in abundance, some pulsating, some shimmering, but unlike so many computer generated samples, many of these are quite beautiful with an evolving, changing character reminiscent of a Wavestation on acid...the spectrum of sounds goes far beyond mere dance music - this is serious film/TV/ambient/sci-fi fodder of the highest quality...don't get the idea that all the sounds are lush and cuddly because we also have Discordant ambience, Gothic Towers, Mutant SFX and Nastee Fuzz to name but a tiny slice of what's available...The only reason I'm giving this set five stars is because the art department refuse to create new graphics for five and a half stars!" "This is one of those rare instances where the sequel surpasses the original, and considering how good DR1 is, that's saying a lot...I can't recommend this CD highly enough if you're looking for evocative, innovative textures and loops." "Without reservation, DR 2 is just as stunning as the first one." *All other manufacturers' product names used in this instrument are trademarks of their respective owners, which are in no way associated or affiliated with Spectrasonics. These trademarks of other manufacturers are used solely to identify the products of those manufacturers whose tones and sounds were studied during Spectrasonics sound development.